The Clean Air Act requires manufacturers of light-duty vehicles to provide two federal emission control warranties: (A) "Performance Warranty" and (B) "Design and Defect Warranty." These warranties are provided by the vehicle manufacturer and apply to used vehicles as well. The warranty period begins from the date of sale to the original owner. The Performance Warranty covers repairs which are required during the first 2 years or 24,000 miles of vehicle use (whichever first occurs) because the vehicle failed an emission test. Specified major emission control components are covered for the first 8 years or 80,000 miles (whichever first occurs). The specified major emission control components only include the catalytic converters, the electronic emissions control unit or computer (ECU), and the onboard emissions diagnostic (OBD) device or computer. The Design and Defect warranty covers repair of emission control or emission related parts which fail to function or function improperly because of a defect in materials or workmanship for 2 years or 24,000 miles (whichever first occurs), and the specified major emissions control components mentioned above for 8 years or 80,000 miles (whichever first occurs). The manufacturer can deny this warranty coverage if evidence shows that the emission component failure was caused by improper use or maintenance and not caused by a defect. PLEASE post what your general geographic location is. For us to be helpful on the board, all posters really should be including general geography, year and motor. Later two are here, but in this case state level geography makes or breaks it. On this specifically, with(out) the information I honestly have no idea what warranty covers your car, even though I already provided the "how to" info in my quoted text to figure it out. Your apparent assumption in the reply (bolded) is not correct as stated for probably ⅓ of the members here. Preemptively, if you are basically in the south, southeast or Midwest, no joy. Other states TBD. If in those states, for a real corner case, look at (or know if original owner) what state in which the car was first delivered--in case it varies from where you are now. 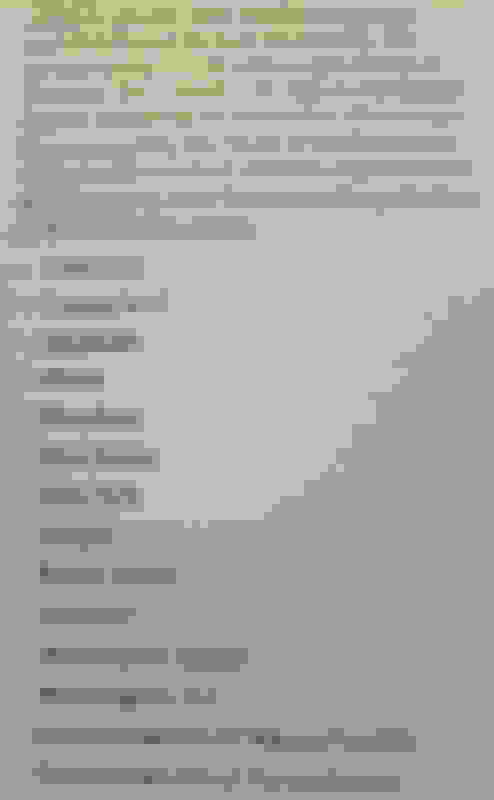 Last edited by MP4.2+6.0; 03-24-2019 at 11:52 AM. Ok, my car came from Connecticut, it was a dealer loaner, now it is in the Midwest, do I qualify for this extended warranty ? 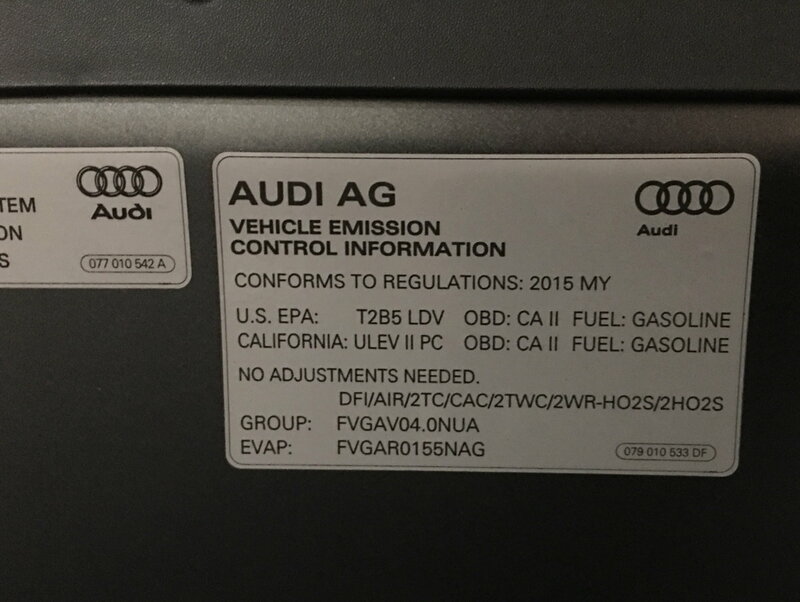 CARB and non CARB emissions--actual vehicle stickers? Related to the warranty subject on blown turbo's, I want to look into the actual emissions stickeringing of the 4.0T's. My car was sold new in CA, and then to me as a CPO after only a year by the same selling dealership in CA. Thus, mine is relatively "easy" to follow in the fact pattern, and I can see I have a CA type emissions sticker. Can I get an A8 or S8 4.0T owner who KNOWS their car was first sold by an original USA Audi dealer in a non-CARB state to post a picture of theirs? Basically, a 4.0T model (A8 or S8) clearly first sold in the South, Southeast, Midwest, or most of NON-coastal West. Be specific on the state car was first sold in. The sticker in on the underside of the hood near the front edge. This is a work in process to be clear. 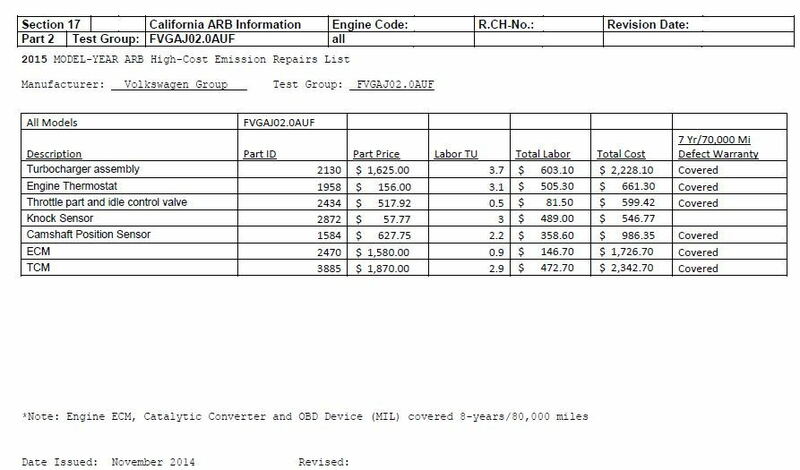 Do NOT assume if your car has the California reference it gets the CARB warranty--regardless of where you are. 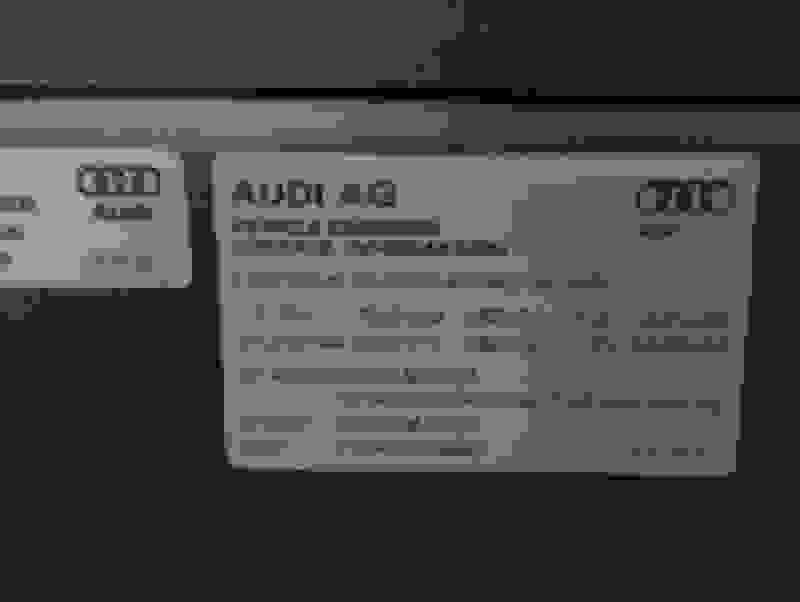 That is, I think Audi may have built the D4 generation for "50 state" qualification, but the warranty provisions don't work that way. For now I am just trying to see if there is an sticker level difference one can spot on a given car, and avoid the whole "what's my history" research or question. Here's mine, where you see clear reference to both Federal AND California. 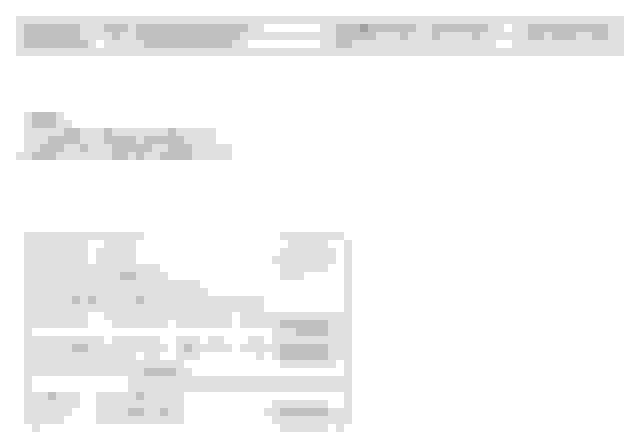 Last edited by MP4.2+6.0; 03-24-2019 at 02:15 PM. I did in my initial post. However, CA may have additional consumer protection beyond audi warranty period. You may have the "better" answer given this fact pattern, but let me check one further nuance to be sure you don't have a corner case within a corner case. The history crossing state lines is already the first corner case. Question: Do you know if your car was clearly "first sold" in CT? The dealer could well be that purchaser for the loaner use, but from my experience it depends on documentation. 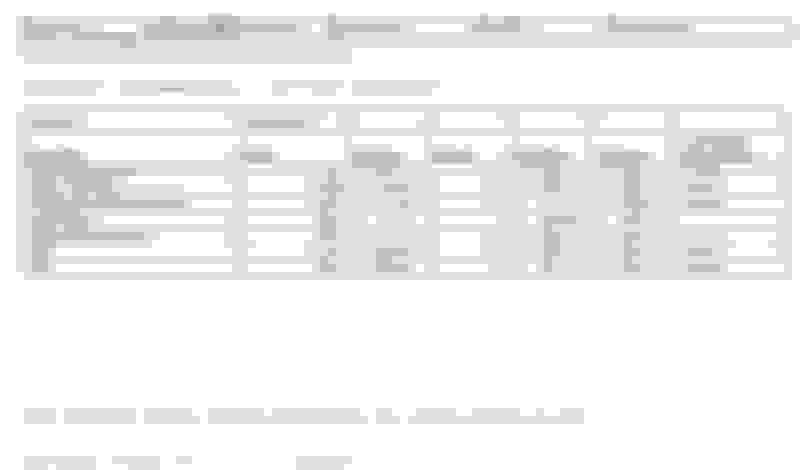 A CarFax with ownership and registration history may be one indicator. 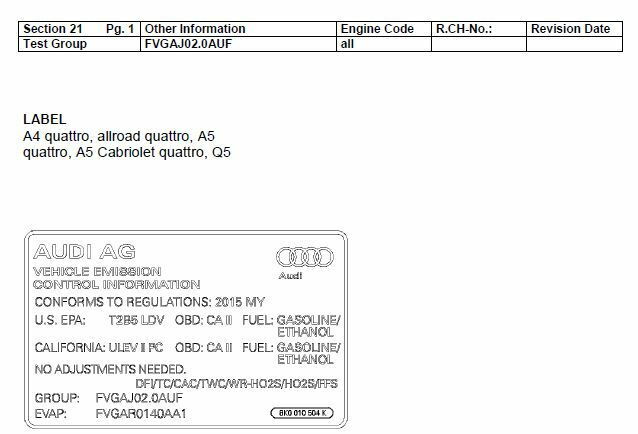 Another and better one is the warranty and miles original in-service date that Audi maintains, coupled with where car was registered at that date. Dealer service could tell you the warranty in-service ("start") date. If the paperwork was done properly when originally delivered and it stayed with the car, it should be written into the warranty and service booklet in the glove box. The weird concept to watch out for is a "house car." What's great about a house car is warranty doesn't "start" until they finally sell it. But in your fact pattern that might not be good once you clock out of 4/50 Audi warranty if car was never deemed sold with the CARB 7/70 emissions warranty applying. Back on my D3 W12 it was a good answer--the dealer manager owned mine as his personal ride for earliest history of car. It meant the dealer had to pay for his own service and such, but it deferred the warranty start date in my favor. I think most dealers just title the car as though sold, since it will be viewed as used anyway. Last edited by MP4.2+6.0; 03-24-2019 at 02:20 PM. Just trying to pin down: does that mean it started at essentially 0 miles and in that year period before you bought the car, it was being used as a loaner at the CT dealer? 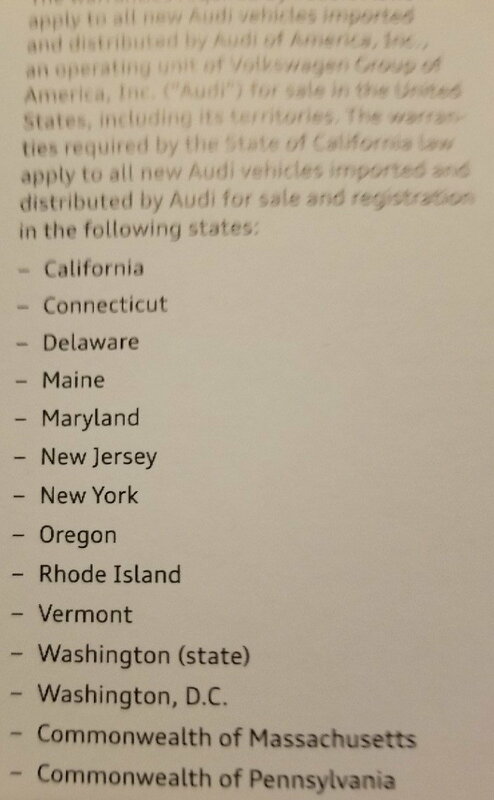 here is a list of states following the emission rules of California for the warranty, from California emission booklet that came with the S6 manual. Last edited by m444; 03-25-2019 at 09:44 AM. I just noticed the sticker on my car lists 502 or 504 oil. Last edited by m444; 03-25-2019 at 09:43 AM.